The Congress on Thursday indicated it was ready to meet the expectations of the Samajwadi Party (SP) for a ministerial berth in the newly-formed Madhya Pradesh Government to salvage the ongoing talks on grand alliance in Uttar Pradesh to take on BJP in the 2019 Lok Sabha polls. 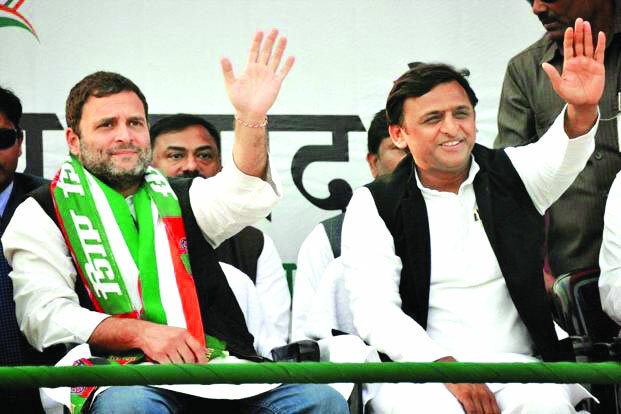 After SP chief Akhilesh Yadav expressed his resentment over the grand old party’s “attitude” and backed the proposed Federal Front being proposed by Telangana Chief Minister K Chandrashekar Rao, the Congress went out on Thursday for damage control and said it would try and sort out differences between the two parties. “The statement of the SP national president shows his discontent. Discontent is not shown for strangers. The Congress and SP’s leadership will sort out the matter themselves. People want our parties to fight elections together,” UP Congress chief Raj Babbar told The Pioneer in a brief interaction over the stalemate in the Opposition alliance in UP. Babbar, who is also a Rajya Sabha member and has represented both the SP and the Congress in the Lok Sabha from UP that accounts for the highest number of LS MPs, pointed out that both the parties fought together in the UP Assembly polls. When asked about the criticism that Congress behaves like “big brother”, Babbar said in politics no one is big or small and the democratic system is guided by people’s mandate. “The people of UP want both the parties to fight the 2019 elections together. His concerns may be genuine and I would definitely discuss it with Congress high command. I am hopeful the concerns will be accommodated in the interest of like-minded parties who are ready to defeat the BJP in the LS polls,” Babbar added. Akhilesh on Wednesday lauded KCR for “striving hard” to form a Federal Front of regional parties ahead of the 2019 Lok Sabha elections and that he will meet the Telengana CM during his Hyderabad visit next month. But to a question on including the Congress in any alliance to take on the BJP unitedly, the SP leader expressed displeasure over the SP’s lone MLA in Madhya Pradesh not being made a Minister in the Kamal Nath-led Government. Though the Congress, with 114 seats, emerged as the single largest party in the 230-member Madhya Pradesh Assembly, it failed to cross the halfway mark (116) on its own and enlisted the support of the BSP and the SP, which have won two and one seats respectively. However, no MLA from the Mayawati-led BSP or the SP was given place in the Cabinet. Responding to another question, the former UP CM said as days to polls are approaching all options remain opened as who will join hands with the SP or not. Meanwhile Karnataka Chief Minister H D Kumaraswamy said the JD(S), an alliance partner of the Congress in Karnataka, has not yet discussed with the national party about the seat-sharing formula for the 2019 Lok Sabha elections. The Congress-JD(S) alliance is strong and it would contest the Lok Sabha polls together, he said. The JD(S) leader’s comment came in the wake of Congress leader Siddaramaiah in Hubbali on Thursday rubbishing BJP’s claim that the coalition Government in Karnataka would collapse due to an internal rift. “There has not been any discussion on this (seat sharing) with the Congress so far. When the discussion has not yet taken place, then there is no question of any fight,” Kumaraswamy told reporters when asked if the two parties have reached a seat-sharing formula for the 2019 polls. He was in the national Capital to meet Prime Minister Narendra Modi to discuss issues pertaining to the State.